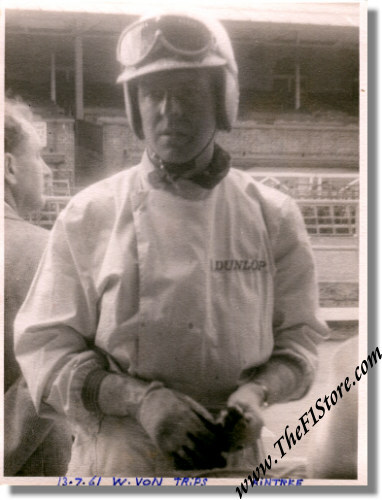 This is a vintage 1961 photo of Count Wolfgang Berghe von Trips (1928 - 1961) in the pits of Aintree on July 13, 1961 during a practice session for the Grand Prix of Britain 2 days later. This was a mere 2 months before he died at Monza race track! The photo is in excellent condition (although not super sharp, it could be described as "somewhat soft-focus") and measures some 4.75 x 6.25 inches. The photographer wrote "13-7-1961 W. von Trips Aintree" on the bottom border (visible in the scan). You can leave it there "as is", trim the borders off the photo or have it disappear under a matting when you have it framed. Wolfgang would drive a Ferrari 156 Sharknose in this Grand Prix and although he only qualified in 4th position, he would go on to win the race. A GREAT vintage and VERY late photo of von Trips.